The award-winning recording artist and song writer is back in the Philippines for a series of shows in different parts of the country. Who would ever forget David Pomeranz? His songs have captured the hearts of every Filipino and for a lot of times have moved me to tears every time I hear "On This Day", and "Born For You" playing in the airwaves. Most of his songs have been chosen by many couples’ theme song and the greatest hit "King and Queen of Hearts" have been the official prom and ball song over the years. 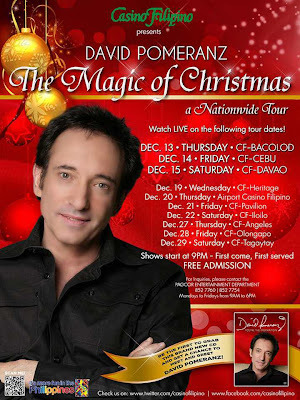 Catch David Pomeranz as he shares love and music once again, see the Philippines schedule from the poster below.